“. . . Two percent, however, did not submit themselves to this united resolution, and therefore had to be disfellowshipped because of their unchristian conduct.” – Dresdener Neueste Nachrichten, April 12, 1918. “During the course of the war there were nevertheless isolated members among them. . . which. . . walked from town to town to entice others in word and writing to take the same step. Called to account for this by the church, because of their stiff endurance in their position and as threatening the internal and external peace, they had to be disfellowshipped from the church. The leading men were therefore responsible for disfellowshipping the faithful members. No, these members did not walk out of the church; nor had they been unfaithful; nor were they fanatics. All they did was stand firmly for the truth; they would not yield or conform to apostasy. This was their only apparent fault; at least it was a fault in the sight of men. Everywhere in Europe faithful brothers and sisters found themselves ousted from the church overnight – the church they loved and cherished with all their hearts. To them, was not the church the body of Christ on earth? Was it not also their ark of safety? Wasn’t this the church against which the gates of hell could not prevail? But now they were cast out, separated, cut off from their brethren, totally against their own wishes. “Choose poverty, reproach, separation from friends, or any suffering rather than to defile the soul with sin. Death before dishonor or the transgression of God’s law should be the motto of every Christian.” – Testimonies, vol. 5, p. 147. Now, what about the young brethren who received the draft call to report for duty in the armed forces? As mentioned before, the Adventist men, almost without exception, entered the armed forces for combatant service. Those who refused to obey were apprehended, incarcerated in jails and penitentiaries, and tortured beyond description; some died from the rigors of prison conditions or were shot to death by the firing squad as faithful martyrs for the Lord. In spite of the separation from the church forced upon them by the leaders, the faithful ones for a long time ignored the unchristian treatment and faithfully attended the church services as before, including bringing their tithes and offerings. “These unprofitable elements set themselves up as preachers, and with small results made propaganda for their foolish ideas. They call themselves falsely preachers and Adventists; they are not, they are deceivers. When such elements shall receive their merited punishment, we regard it in fact a favor done towards us.” – Dresdener Neueste Nachrichten, April 12, 1918. And so it was that a score or more faithful brethren were betrayed by their own leaders to the Secret Police, seized, arrested, condemned, and finally slain as martyrs. We repeat, this was wanton betrayal by SDA ministers and leading men. We remind the student at this time of Lesson 3, in which we showed that one outstanding characteristic of apostasy is the spirit of persecution, encouraged by the great red dragon. We regret indeed to state that this policy was evident also among the Seventh-day Adventists during this period. The most dramatic of all the characteristics in favor of the divine calling of this Reform Movement is the fact that this sprouting protest movement was NOT the idea of one man, nor of two or three, nor of even a group of men. Instead of this, there were faithful believers in different churches and nations; they had no contact with each other except through individual chance encounters. All of these suddenly found themselves in a similar situation of being cast out of the church. This, we believe, was GOD’S HAND; everything happened according to historical precedent, because God’s holy law was touched and changed. It was a true reformation, not based on any man’s fickle ideas but on the living principle of obedience, involving questions concerning life and death. When World War I came to an end in 1918, there were thousands of disfellowshipped, sympathizing, and scattered souls throughout the European countries who had stood firm. 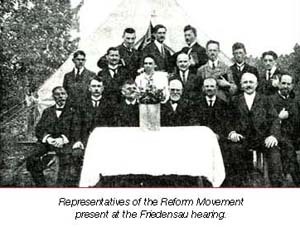 These people called for a general meeting to convene in Magdeburg, Germany, in 1919, to plan and counsel together about the work. Here representatives from many countries related their experiences of the fearful trials they had endured and how the Lord had miraculously preserved their lives. But uppermost in their minds was the desire to find ways and means to reunite the church on the old platform of truth. An appeal to the General Conference was prepared, in an effort to settle the existing difficulties. In answer to this appeal they were assured that they would receive a hearing the next year, 1920, at Friedensau, Germany. “1. How does the General Conference stand with reference to the position taken by the leaders of Germany in the year 1914, toward the fourth and the sixth commandments? “2. What proofs are brought to us that we have not, from the beginning, taken the Biblical path? “3. What is the position of the General Conference toward the Testimonies of Sister White? Are they inspired? Yes or No? Is Health Reform still the right arm of the message? “We have taken the position that each one should act according to his own conscience in this matter.” – Protocol, p. 36 (these minutes were taken and published by the Seventh-day Adventist denomination). In the reply given by the General Conference, those who stood faithful could see clearly that a completely foreign concept, a brand new teaching of “liberty of conscience,” had been introduced. We do believe in, and subscribe to, the concept of freedom of choice, freedom to think for ourselves. This is indeed one of the privileges of the Christian religion. But there is a vast difference between this and the decision of the General Conference. In the latter case, they are referring to the law of God, the Sabbath of rest, and the strict command, “Thou shalt not kill.” Surely we have freedom to disobey, just as did Lucifer in heaven; but we shall reap the harvest of rejection and eternal loss. “Were men free to depart from the Lord’s requirements and to set up a standard of duty for themselves, there would be a variety of standards to suit different minds and the government would be taken out of the Lord’s hands. The will of man would be made supreme, and the high and holy will of God – His purpose of love toward His creatures – would be dishonored, disrespected.” – Mount of Blessing, p. 51. This new teaching – a spurious “liberty of conscience” concerning the controversial question of the war – effectively closed the door to the return of the disfellowshipped individuals. These words placed the final seal on any further negotiations between the two sides. This was an attempt to end the whole matter, just as the seal placed on Christ’s tomb was supposed to keep Him there. But in both cases it was just the beginning. from the General Conference Committee, Brethren A. G. Daniells, L. H. Christian, F. M. Wilcox and M. E. Kern. Chairmanship: Brother A. G. Daniells. Brother Wilcox gave the prayer. 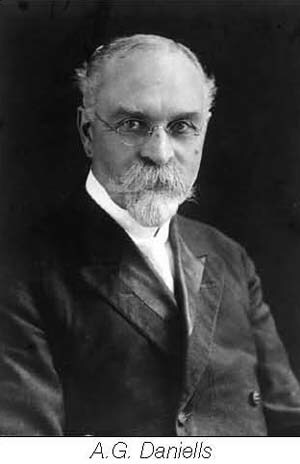 As translator, chiefly Brother L. R. Conradi, in the following sessions alternating Brethren M. H. Wentland and W. C. Ising. A. G. Daniells: We have sent for Brother Ising but will not wait for him as translator and will begin. Protocol – a translation from the German protocol reproduction of page 3 of the minutes taken at the meetings in Friedensau, Germany, July 21-23, 1920. The “Protokoll” totals 62 pages. 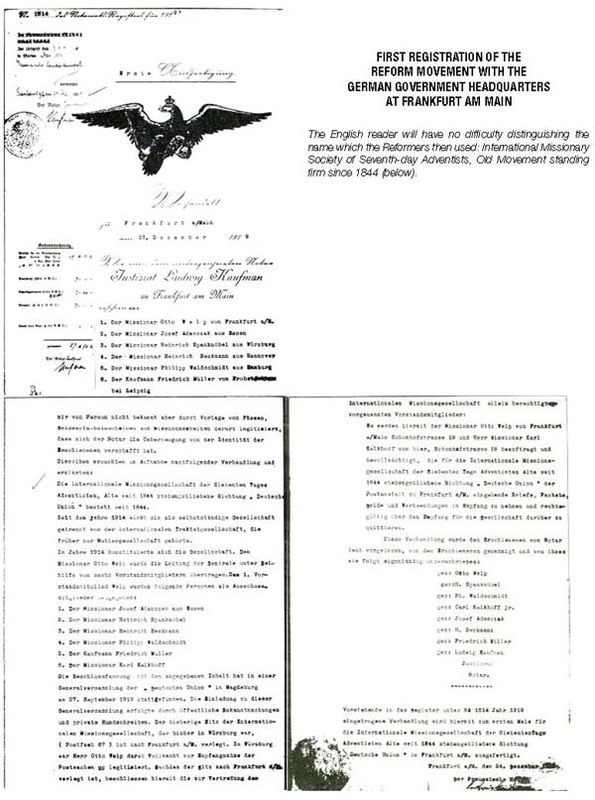 FIRST REGISTRATION OF THE REFORM MOVEMENT WITH THE GERMAN GOVERNMENT HEADQUARTERS AT FRANKFURT AM MAIN 1919 used the name: International Missionary Society of Seventh-day Adventists, Old Movement standing firm since 1844. 1. What did the open apostasy cause among the believers? 2. What was done with the steadfast believers? 3. What were the motives for the faithful ones' actions? 4. What happened to those who refused to obey the draft call? (Remember: There was no provision for conscientious objectors at all.)? 5. What attitude did the apostate leadership take toward the faithful few? 6. How do you know that the Reform Movement did not spring from one man's idea? 7. What efforts were made to reconcile differences? 9. Was the reply made by the president of the General Conference the one that was hoped for? 10. What false principle of conduct was introduced here?